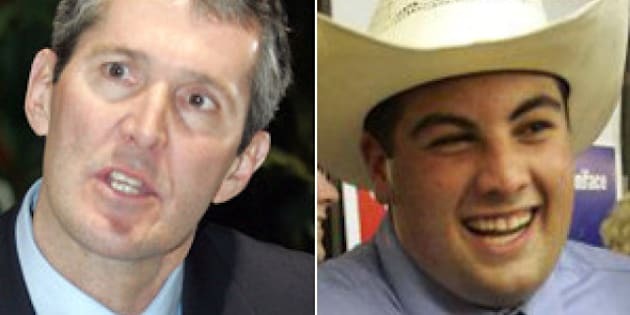 WINNIPEG - Manitoba Opposition Leader Brian Pallister has denounced racist comments from his party's former youth president, but he is refusing to apologize for them. The stance may add more fuel to a controversy that has dogged the Progressive Conservatives for the last week. Pallister said Thursday that comments posted on two social media sites last Friday by Braydon Mazurkiewich, which included a reference to "freeloading Indians," are abhorrent. "What he said was wrong. What he said was unacceptable to any thinking Manitoban. It was dealt with immediately," Pallister said. But he rejected a call from aboriginal leaders for an apology on behalf of the party. "These are an individual's comments. These were never opinions of the party ... nor of mine, so that request would not be in order, in my estimation." The post created an online furor and within hours party president Ryan Matthews asked for and received Mazurkiewich's resignation as youth president. Some aboriginal leaders demanded more. Grand Chief Derek Nepinak of the Assembly of Manitoba Chiefs called for a Tory apology and cancelled a planned meeting with Pallister. "I would like to suggest that a board of directors meeting be called for this Friday to deal with this matter immediately," Clay Purves, a Tory regional director, wrote in an email obtained by The Canadian Press to other board members. "I did not join to advance hate speech or to propagate racial stereotypes. I am disgusted that somebody would believe the things Mr. Mazurkiewich believes in the 21st century." Under the party's constitution, the board can ask a credential committee to revoke an individual's membership. Pallister would not take a position on the idea. "That is certainly a responsibility that volunteer members of our party have — to deal with who should be accepted as a member of the party — and they will deal with that." Mazurkiewich admitted last week that his comments were racist and has issued apologies on a couple of occasions that appear to fall short of a full turnaround. "December 14th I made a statement that does not reflect my view on all aboriginal people," Mazurkiewich said in a written statement Wednesday. "First I would like to apologize to the P.C. Party of Manitoba for the negative media they've been receiving over the past few days. This is not at all P.C. party attitude or policy. My misguided comments were my own. Secondly I'd like to apologize to all aboriginal people who work hard and pay taxes and help make this country a better place." The urban reserve planned for the Kapyong Barracks site is intended to be a mix of residential and commercial development to create jobs for First Nations who are still owed land from Treaty One which was signed in 1871. The continuing controversy overshadowed a Friday news conference by Pallister on public subsidies for political parties. The NDP government has appointed Paul Thomas, a political science professor, to examine ways in which parties could receive taxpayer funding for their day-to-day operations. Pallister called on Manitobans to boycott the process and instead tell the government there should be no subsidies.